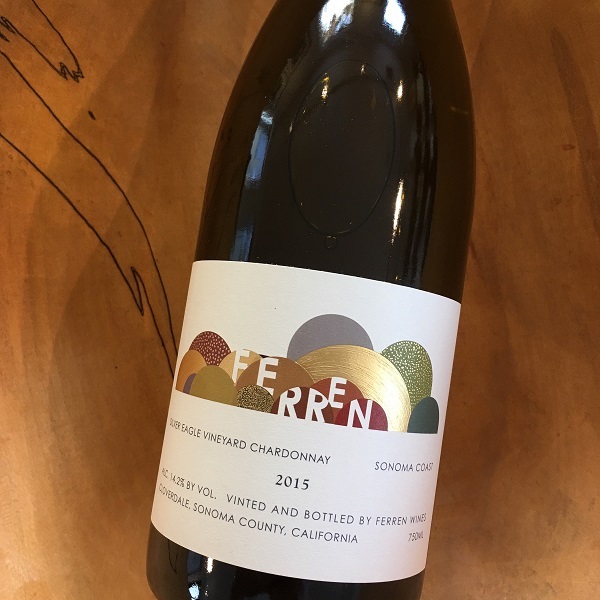 This 2015 Chardonnay is Matt Courtney's third vintage of Ferren and comes from Silver Eagle Vineyard, where Occidental moves into Russian River Valley. It is the second ridgeline in from the Pacific Coast and gets the best of both worlds- the cooling breezes from the Pacific Ocean and the warmth being proctected. Mark Aubert and Matt split this vineyard with Matt getting Old Wente clone Chardonnay. Aromas of citrus oil and hazelnut lead onto the palate with a silky texture. The 2014, like the 2013, offers hazelnut and citrus notes with a touch of minerality to keep the Chardonnay from getting too heavy. It is a beautiful Chardonnay that will only evolve with time in the bottle. 110 cases were produced.